Electric Race News: Toyota PRIUS GT300 race car - Prius? Race car? Yes! Toyota PRIUS GT300 race car - Prius? Race car? Yes! Rumors surfaced yesterday based on a report in a Japanese motorsports magazine that Toyota was planning to enter the Super GT race series with a GT300 class car based on a Prius. Yup. 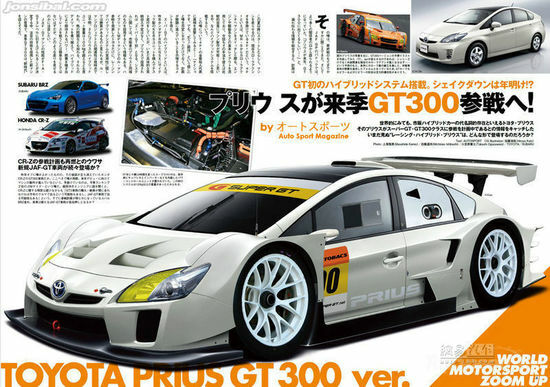 The Prius GT300. Rather than start with Toyota's GT86 sports car, they're starting with a Prius. Obviously they're looking to blow apart the stereotype of the Prius being a pokey family car, and get some testosterone into the brand. Or something. Not many details were available, not even an official confirmation. The Toyota Motorsports website hasn't been updated in awhile, doesn't even have anything on that electric race car they took to the Nurburgring last summer. We'll have to keep an eye out on SuperGT.net for their list of entrants in next years series.